SUMMARY: Eighteen-year old Mackenzie Thorne is running out of time. As a changeling, she must choose her permanent form before she turns 19 in just a few months. Does she want to be a vampire? An angel? A fairy? Demon? So many to choose from, and Mac just isn't ready to pick only one for the rest of her immortal life. Forced to live as a human by day, Mac attends high school. When she is partnered with nerd-boy Winn for a research project, Mac is surprised to see that Winn has somehow obtained an ancient book that seems to be about Mackenzie's own life and the hidden paranormal world. Desperate for answers about herself and her mother's death, Mac befriends Winn in an attempt to steal the book. The clock is ticking, and Mac has no time to waste. WHAT I LIKED: Very unique! Lately, I've been getting a little bored with the paranormal romance genre because there are so many that are the same. 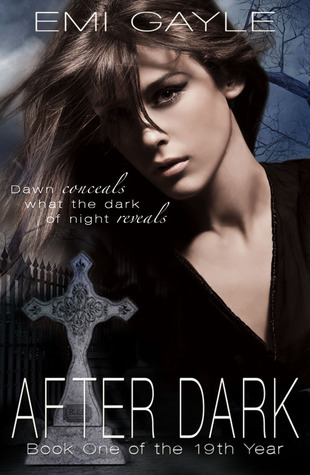 It is a rare book that makes me wish it had been longer, but After Dark is deliciously different. Mac is a changeling living her daylight hours among humans and in human form. Mac hates stupid, defenseless, predictable humans...that is, until she actually takes the time to get to know a few of them. I love the changes in Mac's character from sardonic, angst-filled teen to someone who learns to accept people and even love them. Featuring a huge cast and variety of paranormal creatures, the story keeps readers guessing. There are several subplots to keep things interesting--a murder mystery, a human girl who sees "ghosts," the unrest with the council, Mac's choice of form--but the main story is, of course, the romance between Mac and Winn. I love when the book nerd takes center-stage as the romantic lead! Winn is a strong, brave, SMART character, and he complements Mackenzie's character perfectly. WHAT I DIDN'T LIKE: Rating this book is difficult for me. The story itself is engrossing and unique, and for plot, character, and world-building, I give After Dark a solid four-stars. It is the dialogue that really throws me off. I'm not sure what it is, but the teen characters don't always sound like teens. Sometimes, the speaker's identity is ambiguous. I kept feeling like I had missed something somewhere (reading too fast? ), but when I would go back to reread the section, I still didn't fully understand what they were talking about. It was as though important parts of the dialogue had been edited out, and it sometimes comes across as disjointed and confusing. It was bad enough for me to consider lowering the rating for something that could easily have been a five-star book. I rarely think a book should be LONGER, but in this case, it feels as if important dialogue was shortened or omitted for the sake of brevity. This is a good story by a debut author who deserves more page-time, and I wonder if the editors were forced to cut more than they wanted to. I would be very interested to see this book before it was edited for content. What else was left out? THE BOTTOM LINE: A unique story that feels a bit over-edited. Read it for the dynamic paranormal characters, world-building, and swoon-worthy romance. STATUS IN MY LIBRARY: We don't have it. I am not necessarily opposed to getting it, but with 18-year old main characters, it may a bit too mature for middle schoolers. Drugs/Alcohol: mild; fairy-made potions used for healing and "forgetting"
Thanks so much for being a part of my blog tour and for hosting the giveaway! So glad you enjoyed the book!